Product #16502 | SKU UWPD11CE42 | 0.0 (no ratings yet) Thanks for your rating! The UWP-D11 belt-pack wireless microphone package offers the sound quality of digital audio processing combined with the reliability of analogue FM modulation. 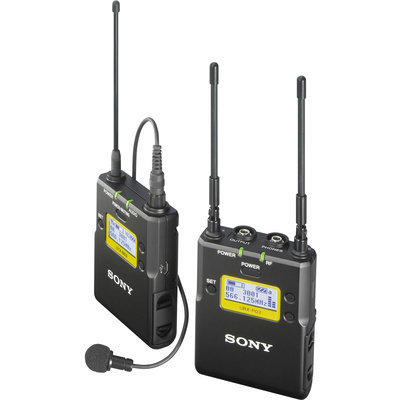 The package includes the UTX-B03 belt-pack transmitter and URX-P03 portable receiver. Also included is a high quality omni-directional lavalier microphone and a range of accessories including windscreen, microphone holder clip, belt-clip and shoe-mount adaptor. The Sony UWP-D11 features all-metal construction, easy to read LCD displays, a wide switching RF bandwidth, USB power and charging, automatic channel scanning, infrared synchronisation between transmitter and receiver, Mic/Line switchable input on the bodypack transmitter, a true diversity receiver, PLL-synthesised tuning, a headphone output on the receiver, output gain controls on the receiver for optimising the input level into a camera, and digital companding circuitry. The package is suitable for a wide range of wireless applications such as ENG, documentary work, talk shows, conferences, and more. The transmitter can operate for up to 8 hours on two AA-size alkaline batteries, be powered or recharged via USB micro B connection, and features a comprehensive LCD display. The system comes with an omnidirectional lavalier microphone, a windscreen for the microphone, a microphone holder clip, two belt clips, a shoe-mount adapter, a 3-pin mini to mini stereo cable, and a 3-pin mini to XLR cable. Optional accessories such as a battery case and soft case for the receiver are sold separately.